Jesus was naked. He was stripped bare and lashed, punched and brutalised until he was hardly recognizable as a man. Romans would have delighted in humiliating a supposed King of the Jews. They were an occupying army and occupying armies love to get at those who despise their occupation. Jesus was naked. He wore a cloak of purple mocking his true status as the true king. He was verbally insulted but even a centurion confessed that he was the son of God. He had no loincloth to clothe his shame. Jesus was naked. In his nakedness is something disclosed? He hid nothing from the world. He had revealed everything to his disciples. He did not hide himself. He loved us fully. Before us he hung naked and bore the shame that was rightfully ours. Yet in our art and sculpture we clothe him quickly. We can’t stand that level of exposure. A body or a soul that is truly exposed in some way exposes us. It exposes our hidden hearts, our shrouded minds, our darkened souls. A man that has nothing to hide sends us running for cover. He bids us come. Come and see. Embrace a maturity that can cope with full disclosure. Be naked. Expose your heart, soul, mind and strength. Share the pain and the suffering of the cross. Take up a cross daily and follow him. Exposed and alone you hung for a time. Nowhere to hide. Nothing to hide behind. I keep myself hidden, even from you. There are no lengths you would not go to. Excrutiating. I shun pain. I fear exposure. Cleanse me with the blood that you shed. May walk in the paths you walked, following my King enthroned on a cross. How would you describe Roman treatment of Jesus? Why does Jesus say the things he does? Why is Jesus clothed in our art when there is no indication he was clothed in the text? How do you take up your cross daily? The Romans brutalized Jesus: mocking, beating, tormenting; it was mayhem. In part, Jesus fulfilled prophecies regarding his death, but they were prophesied because that would be the true state of Jesus. He called out to the Father asking why He would desert Him. His cry shows the excruciating wrath of God. Jesus was probably clothed to make the art more palatable. 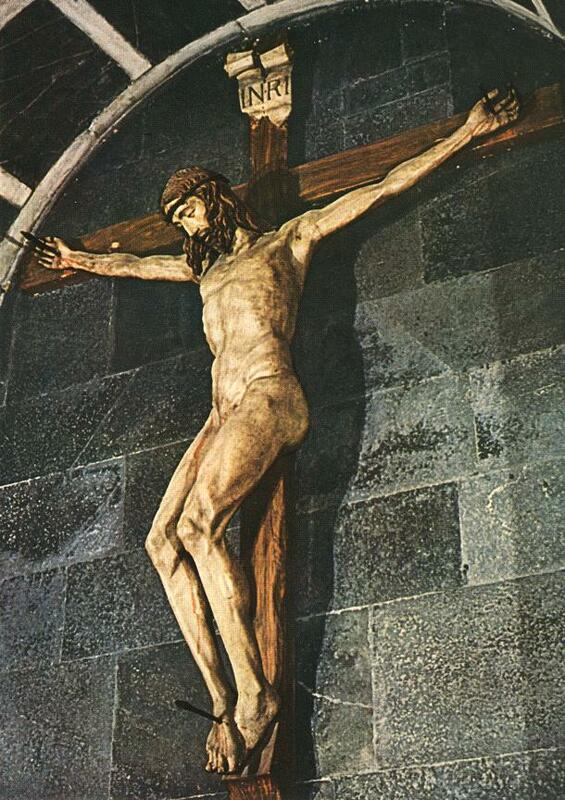 Upon viewing the painting atop this post, I was taken aback by the sight of Jesus naked on the cross. Perhaps it is because we do not want to admit to ourselves so easily how humiliating and horrific Jesus death was; we don’t want to admit how vulnerable He was. In theological terms, which I hope are not divorced from the way I think and act, the cross is where Christ took all of my sin and paid the price for it. Where he suffered a horribly painful and humiliating death so that I could, through His sacrifice be in right relationship with the Father. To me, the cross is that place where Christ became sin so that I would not have to die for my sins. Honestly, I don’t know how to answer this without speaking Christianese, but taking up my cross daily involves emptying me of myself and being filled more with Christ. Using His strength to bear the cross, because His burden is light, but at the same time, it costs my life. As I understand it, taking up my cross daily is when I deny temptation by the power of the Holy Spirit; when I lay down my life (i.e. goals, ambitions, plans and possessions) and follow Christ into His death. The Roman treatment of Jesus was focused on mockery. The Romans gave no mercy as they tortured Him. The only words of Jesus in this passage were, “My God, my God, why have you forsaken me?” Not only does this fulfill prophecy, but it shows the depths of the payment of sin. Our sin separates us from God, and Jesus was taking all of our sin on Himself. I think Jesus is clothed in art because people do not want to fully reveal Jesus. Some may believe its a matter of respect since He is God, and others may simply think it is awkward to show Jesus that way. However, the Bible makes it clear and we should recognize the complete shame He went through on our behalf. When I see the cross, I remember that it should have been me. I should have been the one tortured on the cross. I should have been naked and felt the unending shame. I deserve it. But when I see the cross, I remember the great price that Jesus did on my behalf. I remember His selfless love that set me free from the oppression of sin. I remember that He was given my filthy rags and I was given His righteousness. Each day, my desire is to be in absolute surrender to Jesus Christ. I believe this is what it means to take up your cross. You die to yourself: your comforts, pleasures, etc. and you obey the Father in every move you make. Thankfully, its not about being a slave as much as it is being a child of God. In relationship, we joyfully sacrifice. We obey out of love. This is my prayer for myself as I live each day for His glory. Verses 16-20 is quite shocking. I feel a whole paper could be written on those verses alone. What a mockery, if they only knew what they were doing! I mean they did, but they had no idea this Jesus was the very Son of God! Such is the wickedness of man…cruelly treating and harming someone of “no importance, but at discovery of someone’s status and how they may affect oneself, the best foot is placed forward…It’s hard to believe GOD let Himself be treated that way by finite human beings- by anyone! But I suppose every time these nameless men wacked Him with a reed on the head that was part of God’s plan to pay for my sin and yours. Isaiah 53 does say that it’s through Him calmly receiving those whips and lashes (scourging) that we are healed. I just read through Genesis 1-3 earlier this afternoon. It’s interesting to note that our ancestors- Adam and Eve disobeyed the LORD and gained knowledge that they were naked, and became ashamed..and then years later the LORD Himself dies naked, in the most humiliating, awful way possible for us…He knows how Adam and Eve felt- exposed in the Garden, but He knows it worse. He took on all the world’s sin- what a feat. How remarkable that He turned out victorious, but I suppose no one can beat the God head. This plan was all marked out from the beginning, before the beginning for the glory of the Son. The Romans treated Jesus with contempt, an object of ridicule. They wanted to make Jesus an example of how they felt about the Jews, any attempt the Jews might take at rebellion, and the supremacy of Rome. The words Jesus says have often confused me. They seem to be despairing, full of doubt and confusion…Jesus seems to be expressing His feeling betrayed by the father. However, His words are a quote from Psalm 22. This psalm describes the beatings, crucifixion, and emotional pain of Jesus during his day of death, but it also ends in exultation and triumphant. Jesus not only expresses the emotional agony of separation. He also shouts expected triumph, giving up His spirit with the exultant cry of “it is finished.” Such a picture of the humanity and deity of Christ and the enormity of his love. I think people clothe Jesus because they don’t want him to be so exposed. Most pictures do not show him suffering intensely, beaten, and bloody. We don’t want our king to be so humiliated. And yet, it is precisely because of his humiliation that we can exult him as OUR Lord. We should celebrate our Lord by following him and his example. He suffered through so much and was willing to be exposed beyond anything we are willing, beaten beyond our comprehension, and mocked beyond our patience and mercy. To emulate our Lord who was crucified is to live through Jesus’ example with the help of His Spirit.